The name Aljoya means “happiness.” At Aljoya Mercer Island, everything we do evokes a sense of joy. Whether it’s the warm, friendly residents and staff who greet you each day, your beautifully designed residence, the fresh and flavorful entrées in our elegant dining room, your morning workout in the saltwater pool, or the peace of mind that comes from our care services – you will find that Aljoya Mercer Island has so much to offer. That’s just inside our community. Step outside and you’ll be in the heart of Mercer Island – surrounded by walking paths, restaurants and coffee shops. Mercer Island is an ideal retirement destination with small-town charm and natural beauty, yet close to the city centers of Seattle and Bellevue. Serving Mercer Island and beyond. 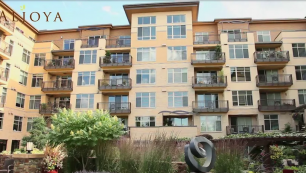 Our senior living community proudly serves the residents of Mercer Island, the Eastside, and more. We offer Independent Living, Assisted Living, and Wellness Nursing Services, all from the comfort of your apartment home. At Aljoya, residents enjoy and genuinely care about one another. The staff is equally responsive and extremely pleasant. The rich array of excursions and presentations offered to residents ensures a vibrant lifestyle for all. My decision to move to Aljoya has proven to be a wise and extremely happy one! Every day there is something interesting going on. There’s always something to do. The community is so luxurious with the perfect location, but the best part about it is the staff and the residents, they are all so kind! The staff is exceptional. They show respect to each and every one of us.